At Multiline Construction we don't just work harder - we work smarter to realise your masonry-inspired architectural plans on time and on budget. There are no shortcuts on our commercial and residential sites, just the latest in Leica digital construction technology and CAD software that allow us to build faster and more accurately. 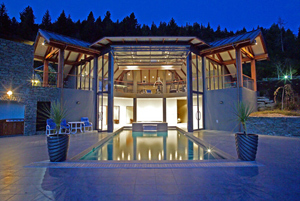 Situated on Queenstown Hill overlooking Lake Wakatipu and The Remarkables, this private pool and gymnasium complex is constructed out of solid Kiwila, glass and concrete with a 2 story high folding glass door. We use Leica total stations, specifically designed for construction, an advanced digital technology that uses electronic laser distance measurement and co-ordinates to determine targets. This allows for much greater speed and accuracy.